I’ve been blogging here on The Happier Homemaker for almost 7 years now so you can imagine that I have a LOT of old content on the blog that didn’t exactly fit with my current topics or branding. After reading this article I decided it was time to go through all those old blog posts (over 1400 of them!) and weed out blog posts that were off topic, off brand or out of date. 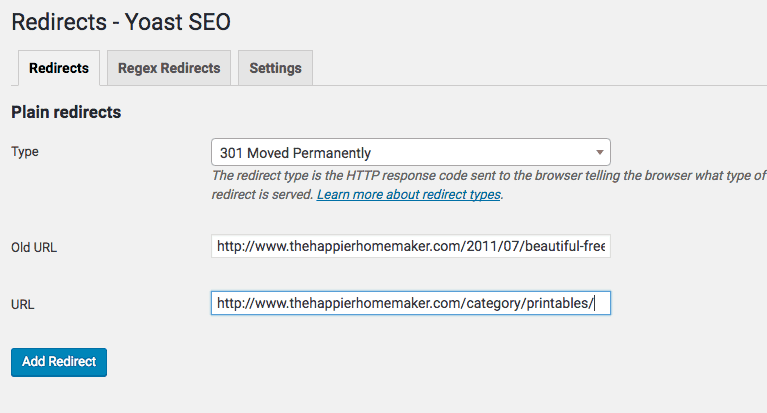 It’s not as easy as just deleting old blog posts however if you don’t want to get dinged by Google for broken links-you have to point those urls to new destinations. 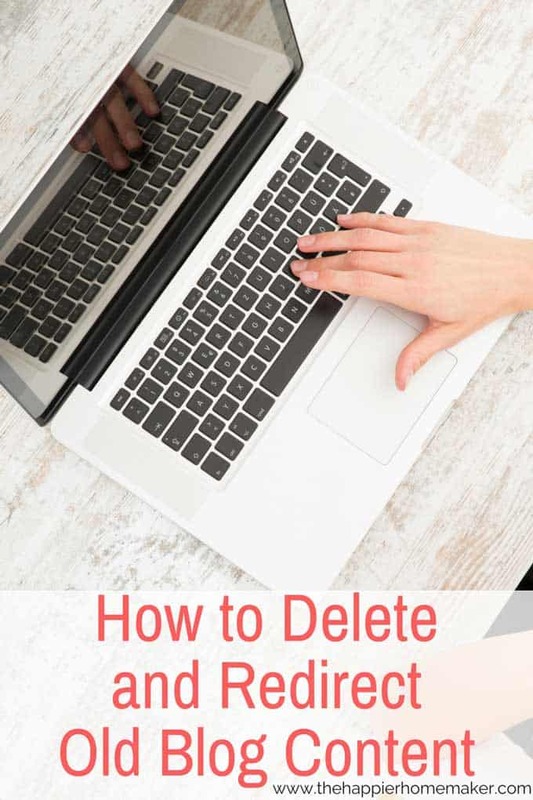 Today I’m going to show you the easy way to delete and redirect blog posts. I’ll get down to it, there is no easy way to do this process without a plugin, specifically the Yoast SEO Premium plugin. I had been using the free version of Yoast SEO for years but when it came time to cull my old content I took the leap and made the upgrade. 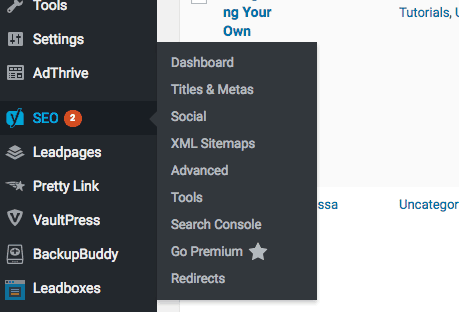 Once you have the Premium version of Yoast you can select SEO on your sidebar and then click on the Redirects option at the bottom. From there you will come to a very easy and straightforward screen with areas to enter the url of the blog post you are deleting as well at the url you would like that redirected to. 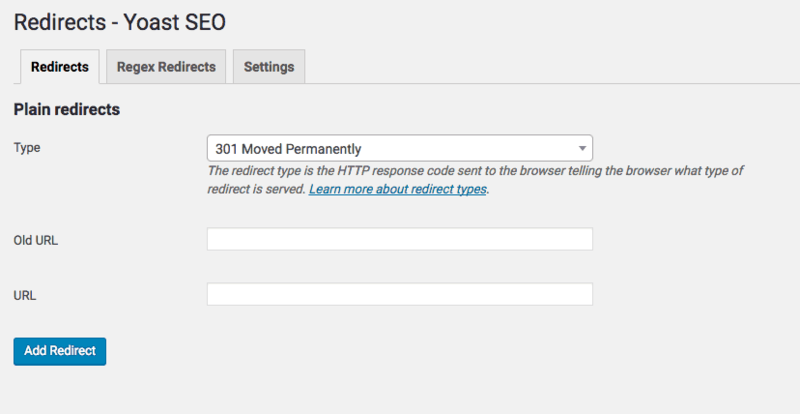 You can choose the type of redirect as well. For mine I opted for the 301 Moved Permanently option but you can read more about the different types on the Yoast blog. 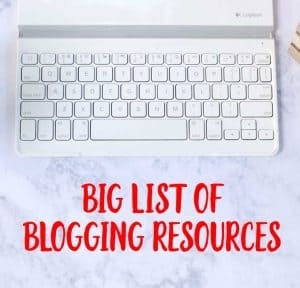 When you delete a blog post you need to redirect it to something as close to the original topic as possible-for me I’m deleting an old post about printables I found on another website (that no longer exists) so I’m redirecting that url to my category page for my own Printables. Enter the two urls into the form and click Add Redirect. Once the redirect is successful you can go into your post page and click “Move to Trash” directly to the left of the update button or find the post on your posts list and click “Trash” underneath the post title. And that’s that! Easy right? I was able to spend a someone tedious day going through my old content and deleted and redirected over 220 posts! It’s been over a week since I deleted the old posts and I have not yet seen any adverse effects in my analytics and I hope it will help me to improve my search rankings. I will update this post in a couple of weeks with more results! Thank you for sharing this informatic blog post. It is really helpful to me.